The distinction between an auction and a tender is that the latter format factors in other issues besides pure price calculations when awarding a contract. Nevertheless, the tendering boom has largely excluded small scale actors, including cooperatives, communities, indigenous people, municipalities, small business, and farmers. So why should the participation of these actors in renewable energy projects be desirable throughout Latin America? “Renewable energy sources, with their inherently distributed nature, modularity and adaptability, offer new avenues for community participation in the energy arena. Community-driven renewable energy projects usually involve local residents where (depending on the structure) they can own, participate in or control the production and/or use of sustainable energy. Typically the majority of the projects’ direct benefits are distributed locally. Also important is the protection of social and cultural identity and strengthened relationship between communities and their land. Local developed projects reduce dependence on a limited number of energy producers, broader distribution of assets and influence within the energy system. It also increases economic resilience of community members through diversified sources of income”. Currently, tenders in Latin America are used primarily in the power sector, and the successful bidders typically are awarded long-term power purchase agreements (PPAs). Elements considered in the design of tenders include aspects such as technologies, guarantees, capacity (MW) vs. energy (MWh), and the reliability of supply. Governments have been pushing tenders and auctions mainly because, unlike feed-in tariffs, these limit the quantity of renewables to be deployed and largely avoids the risk of over-deployment. In addition, tenders, as well as feed-in tariffs, provide certainty in long-term income revenue, which makes projects bankable. Auctions can also be designed to result in procurement of a specific quantity of electricity (or capacity to be built) at a strike price. Renewable procurement schemes can also be designed with a fixed budget, allowing quantity to be determined by the market. While in Europe tenders tend to be complementing and integrating design elements from other renewable energy policy instruments such as feed-in tariffs, net metering and distributed generation, in Latin America this does not happen. 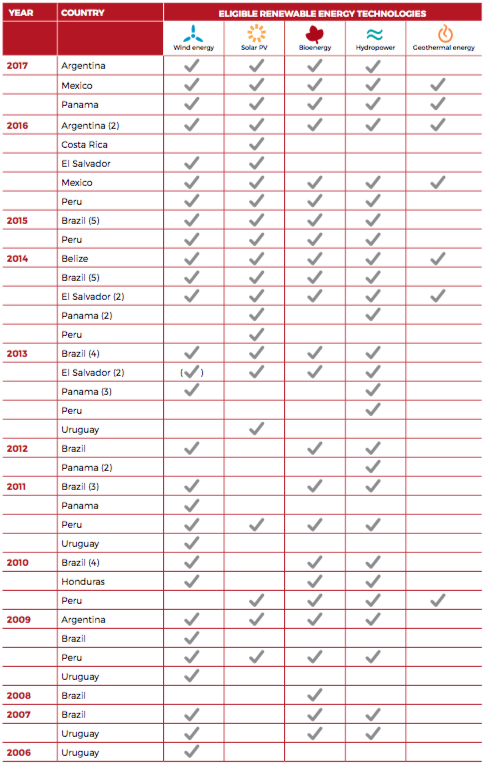 Today, 12 Latin American countries are applying tender or auction mechanisms: Argentina, Belize, Brazil, Chile, Costa Rica, El Salvador, Guatemala, Honduras, Mexico, Panama, Peru and Uruguay. Of these countries, only a few have brought significant changes. In 2013, Mexico initiated a major energy reform, and energy markets were opened to private actors. As a result, of the first three tenders between 2015-2017, 70 projects were to be developed and 67 of them had to come from clean energy sources. The fourth tender is currently in progress and has an estimated production of 13.000 MW in 2021. Tenders are signed for 15-20 years and are technology-neutral, although they are intended mostly for clean energy sources according to Mexico’s Electricity Industry Act (mainly renewables and efficient cogeneration). Where in 2012 the energy generated from renewable sources was only 4%, with the last projects awarded, this percentage will increase to 11%. Nevertheless, the disapproval of the population to the reform has been a majority, mainly because the privatization process has benefited large companies but the citizenship has not experienced any benefits yet. Latin America and the Caribbean (Paris: REN21 Secretariat). In Latin America, the great growth of renewable energies in recent years has been achieved through auctions and tenders almost without incentives for the generation of people or community. However, there are some examples in Argentina and the Dominican Republic where the legislation facilitates performance of community energy. In Bolivia, Colombia and Costa Rica, there are some policies in place to push cooperatives. Costa Rica, for instance, has a old cooperative history. Nowadays there are four rural electric cooperatives: COOPELESCA R.L, COOPESANTOS R.L, COOPEGUANACASTE R.L, COOPEALFARORUIZ R.L. In 1989, they together founded a new cooperative: The National Consortium of Electric Companies of Costa Rica R.L (CONELÉCTRICAS R.L). The memberships of each cooperative differ among 5.000 and 10.000. The National Institute for the Promotion of Cooperatives (Infocoop) provides credits for renewable energy projects by cooperatives, and the National Electricity Institute (ICE), a public company and a major energy utility, has service agreements with rural electric cooperatives to allow their operation in exclusive areas. Overall, these four cooperatives are responsible for 9% of the national distribution and 6% of Costa Rican electricity generation. In Argentina, energy cooperatives go back to the 1990s and already cover 16 percent of the national electricity market. According to figures from the Argentine Federation of Cooperatives and Electricity and other Public Services, there are around 500 electric cooperatives with more than a million members who almost all focus on the distribution of electricity. In 2016, the government of the northern province of Santa Fe created the so-called Prosumers Program, which finances citizens who transit from being only consumers, to generating electricity selling their surplus to the network. In conclusion, one might say that Latin American countries need a series of incentives for small and medium-scale renewable energy projects. Policies that would help include feed-in tariffs, net metering and an active promotion of energy cooperatives. In addition, tenders need to be modified in order to favor a diversity of actors and community-driven renewable energy projects. These can then contract the cheapest electricity from renewables while at the same time promoting the participation of a diverse set of actors.